Business phone service for educators. Teachers, professors, school administrators, principals and staff need a way to communicate effectively and easily. Not only are there numerous administrative tasks and planning that contribute to teaching students, but educators need to be able to get in touch with staff whether they are on-the-go or in the classroom. What do educators need in an office phone system? Educators are rarely – if ever – tied to their desks. They are often moving their students from classroom to classroom in a K-12 setting, moving from lecture to lecture across campus in a university setting, or might be completely outside of building at recess or on a field trip. While every teacher has a personal cell phone that they can use to keep in touch, it lacks professionalism and can cause confusion, especially in a large team setting that many educators are often in. Educators need a business phone line that can help them stay connected to other teachers and school administrators even when they aren’t in the classroom. Tools like extension dialing, mobile access, ring groups and caller-ID could also be highly beneficial in a school or university setting, as these features can keep the entire school’s communication organized and efficient. See how this company was able to manage three business locations from one office phone line, and save money along the way. I would recommend Ooma Office to anyone who is interested in an economical phone package, without the fixed contracts and switches, and with the ability to take my office phone wherever I go. Mobile access: Many educators are going to be involved with work that takes them away from their desks, classrooms and the school or university. Having the ability to make office calls through the main line with a cell phone is a must, and thankfully Ooma has a great app that can help you stay mobile. Virtual receptionist options: Routing calls is crucial in a education setting. This features allows you to direct parents, school system officials, and others to the appropriate person. You can customize modes for school hours and after hours, and create custom messages. All-inclusive price: Educators are often working under a budget, so it’s no wonder that many school administrators want to avoid hidden fees and unexpected expenses for setup and installation. With Ooma, each account comes with a local and toll-free number of your choice (we can even port your existing number), a virtual fax extension for school forms, and a conference extension line. Easy setup: As an educator, you have a lot of things on your plate – worrying about an extensive or expensive office phone setup shouldn’t be one of them. 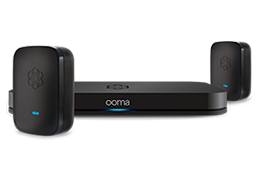 With Ooma, our easy setup has many customers up and calling in minutes with no additional installation fees.